The DIY spirit is what keeps us awake at night. Forever thinking on new projects or ways to conjure up an idea. After picking up some new items from our screen printer, we stopped over to grab some breakfast and read the new Indyweek here in Raleigh. 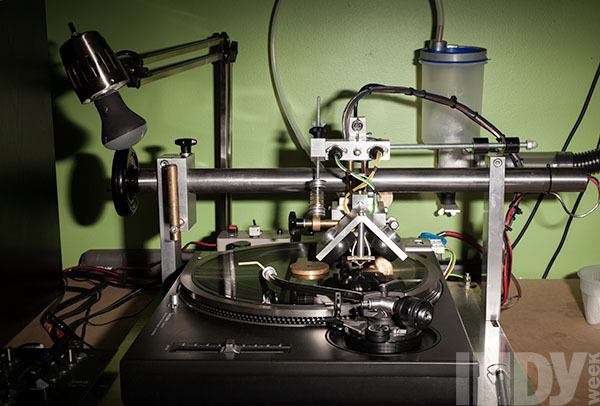 While checking for the show listings at our local music venues, I ran across an article on a dude by the name of Wesley Wolfe and his lather vinyl record cutting machine. Intrigued I was and set off on a tear into the article to read about his endeavors. Luckily the same article is posted on Indyweek and now posted here for yall to check out. Find out more on Wesley Wolfe's custom short run vinyl record editions. 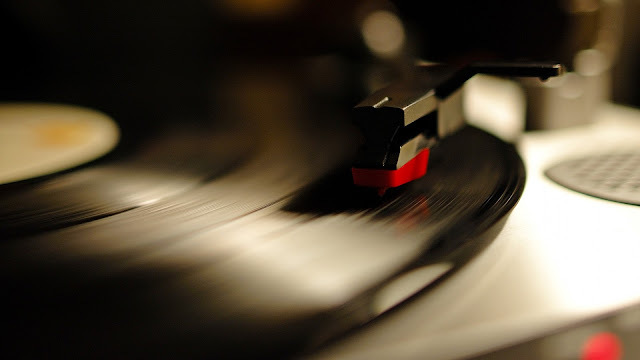 "There were wax cylinders and cassette tapes, compact discs and (at the very end) MP3s, but the 20th century's music belonged to the vinyl record. Despite more portable formats and vast technological advancements, that romance continues and grows: Americans bought 4.6 million records last year, up from 3.9 million in 2011, according to Nielsen SoundScan. At a time when music feels intangible and oversupplied through the Internet, satellite and streaming radio and through the speakers above the grocery store aisle, LPs maintain a tangible link between artists and collectors. The archaic crackle of a stylus dragging dust through a spiral groove supplies a resonance of its own, unlike translucent and pristine digital formats. It's the difference between a silk purse and a Ziploc bag. But like any other mass-consumed product, most records are duplicated in remote factories by the thousand, rolling from a large warehouse onto record shelves. But for locavores and similar connoisseurs, area musician Wesley Wolfe has a more rarified option. For the last three years, Wolfe's one-person business, Tangible Formats, has cut 7-, 10- and 12-inch records in runs as small as one. It's part of an obscure but evolving culture based around small-batch hand-lathed records, a laborious but potentially viable alternative to mass production in a fragmented music market. Wolfe, a musician, initially came to the idea of hand-lathing in 2009, when he released his first solo album on Odessa Records. A distant plant pressed 250 vinyl LPs, the smallest order most manufacturers will accept, at a cost of more than $2,000. Through researching the terms of art in order to speak knowledgably to the mastering engineer, Wolfe realized he was more interested in the process of making records than selling them. "The reality is that I can sell 50 records and I don't have the closet space for the other 200," he explains in his Carrboro apartment. "By the time I sell 50, I'm bored of it and working on something else anyway. I'm not going to do the big promotion and tour, tour, tour." To understand what Wolfe does at home, it helps to first understand what he doesn't do, or how the plastic-wrapped vinyl you might pick up at a record shop is made. Step one in mass-producing an LP is to lathe-cut the music into a manageably soft, lacquer-coated aluminum disc. This fragile master is electroplated in a nickel bath. The metal forms a negative-image mold, or a father. The fathers are electroplated to produce mothers, metal records that are again electroplated to produce more durable negatives—the sons of the fathers and mothers, or the stampers. 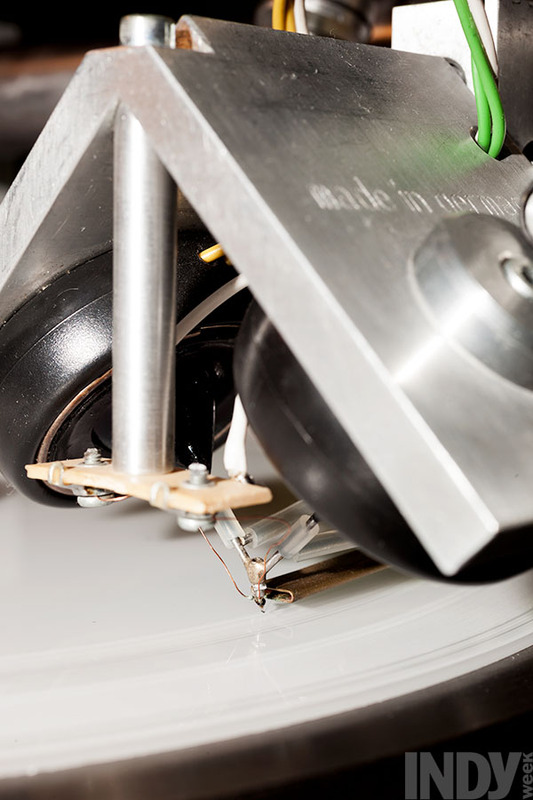 This plating and cutting happens twice, once for each side of the record. At last, using a hydraulic press, the stampers punch out retail discs from vinyl pucks, replicating the original thousands of times. The process requires a lot of space and an army of heavy machinery. When Wolfe cuts a record, he eliminates every step except the first one. Instead of a copy of a master, you get the master itself, perhaps still warm from the lathe. Each record is cut individually: If you order 30 copies, Wolfe hears your music in full 30 times. 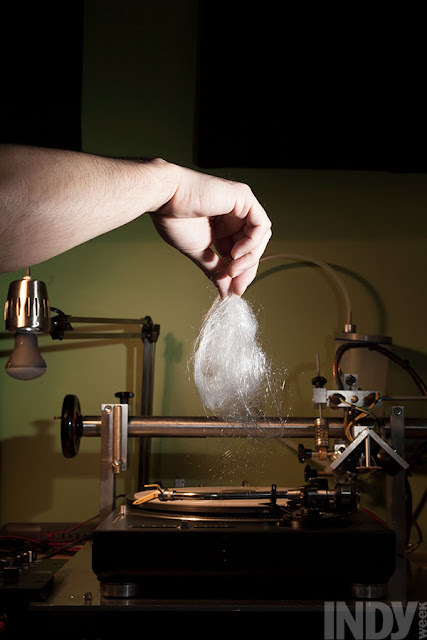 Again and again, the lathe's diamond stylus traces the white thread of the music over the record's creamy blackness. Minute variations, from the music's peak volume level to the width of the groove that comes when the music has finished playing, ensure that no two are just alike. This personal touch comes at considerable cost, with a single 12-inch going for as much as $50 and a 7-inch for as much as $25, with discounts for larger orders. But Wolfe isn't interested in listening to the same song for days on end, and the largest run of 7-inches he'll cut is 50, as he did for the local band Bombadil. More often, his services are employed for personal or novelty records. The concept of the hand-lathed record isn't new: Listeners widely used lacquer discs, or "acetates," before magnetic tape became the format of choice for semi-disposable storage. The dubplates of Jamaican sound systems are so-called acetates. DJs still get tracks cut on them for short-lived used, as their soft grooves degrade after a few dozen plays. But the low sound quality and poor durability can be deal-breakers, even for record labels focusing on "small-run, intentionally collector's edition-type stuff," as Cory Rayborn recently described his label. If any local imprint seems like it should work with the sort of hand-lathed albums Wolfe makes, it's Rayborn's Three Lobed Recordings, based near High Point. But Rayborn said he could never get it to add up. "It's been four or five years since I've really looked into lathed stuff," he explains, "and I haven't heard what Wesley Wolfe is doing. But I own some lathe cuts, and historically, I don't like how they sound, all glitchy and poppy. And they wear out. I thought about doing a Bardo Pond [a psychedelic rock band from Philadelphia] one years ago. At the time, it was really only Peter King over in New Zealand. Dealing with cross-continental shipping, it just didn't make sense." Peter King is a legend among lathers, a scattered community that haunts online forums such as Lathe Trolls. In the town of Ashburton, New Zealand, King uses four tandem lathes to cut into polycarbonate plastic, not lacquer; the records are strong but lo-fi and monophonic. People lathe music into all kinds of plastics, including picnic plates, but cutting directly into sturdy, luxurious vinyl is the holy grail. And of the handful of lathes capable of doing so in the United States, two live and work in Wolfe's apartment. 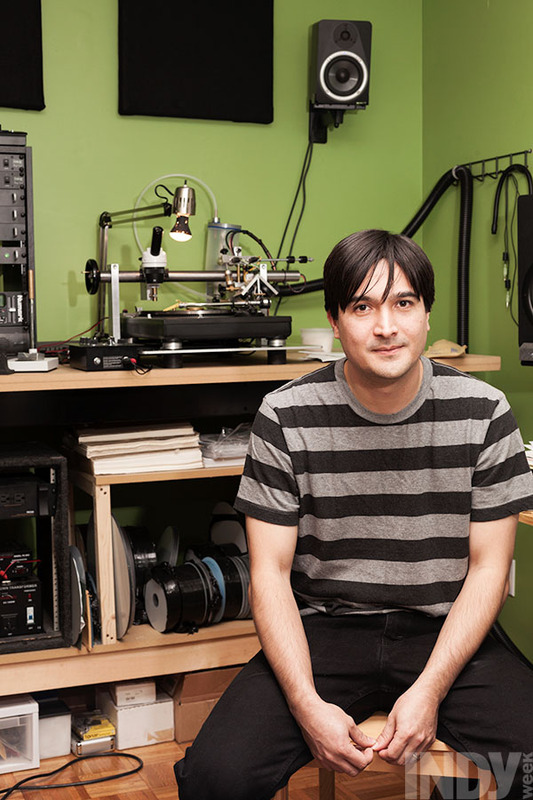 When Wolfe was researching record manufacturing online ahead of his release, he found Souri's Vinyl Recorder website. Not only did this lathe cut straight to vinyl, but it was the only one Wolfe found that also cut in stereo. Because it cut deeper, wider grooves into the vinyl, this lathe produced slightly short LPs at 18 minutes per side. But the loss in space came with a boost in volume and fidelity. Wolfe was sold; now, however, he had to convince its creator, an enigmatic German known only as Souri, to sell one to him. Souri's lathe costs €3,200, or a little more than $4,000, and you can't just drop one in your online shopping cart. It has no instruction manual. Prospective buyers who persuade Souri that they are serious must travel to Germany for a training course. 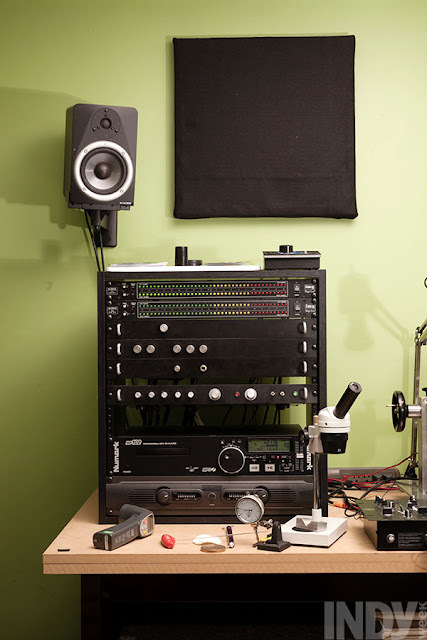 Souri is very protective of his lathe, but Wolfe says what might sound like paranoia is justified: Souri had been pitching his lathe to DJs since the early 2000s, only to reportedly have it shoddily knocked-off by nefarious Russians and abused by feckless Americans. So in 2010, Wolfe flew to an obscure German village with more than $8,000 of cash, as Souri requested, in his pocket for his training and, he hoped, his equipment. Wolfe is cheerful and earnest, with boyish hat-hair and friendly eyes that sparkle; it's not hard to imagine what Souri saw in him. He returned from Germany with one lathe and convinced Souri to visit America to attend South by Southwest in 2012, where the pair led a record-cutting demonstration booth. A second visit to Germany cemented Wolfe's role as Souri's U.S. liaison and technician (and earned him spare parts to restore a second lathe he'd bought in Arizona). In March, the unlikely transcontinental pair will reprise their SXSW demonstration. Meanwhile, Wolfe has turned his machines into a thriving cottage industry. He used Souri's lathe to cut records for locals including Spider Bags, The Toddlers and The Rosebuds. And when the amphitheater-filling folk-rockers Mumford & Sons needed to cut a special song to vinyl for a member's wedding, United Record Pressing, a large plant in Nashville, sent the job to Wolfe. 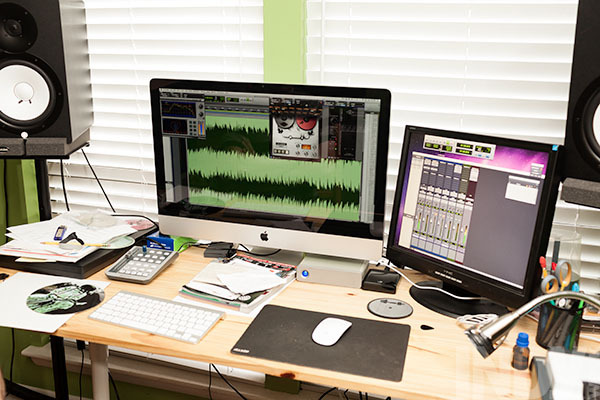 But Wolfe's most frequent and enthusiastic client is John Harrison, a local songwriter, bandleader and visual artist who sees applications for lathe-cuts in all of his media. "I didn't even really know this existed until I heard about Wes doing it," Harrison remembers. "I went to his apartment to check it out, and I was blown away. The fact that he had to go through so much to get the lathe impressed me even more." For Harrison, Wolfe first cut a 7-inch record on transparent vinyl, with a unique demo from his band, jphono1, on one side. He left the other side blank, so Harrison screen-printed the image of a cassette tape on it in neon green. Matted and framed, the piece sold for $60 at a Minus Sound Research gallery show, proving that the high cost of Wolfe's one-by-one manufacturing doesn't rule out profit for the creative and resourceful. "You can hardly twist people's arms to buy one 7-inch for $5 when your band plays," Harrison says. "It would take me multiple shows to make that much on sales with the band. And you can't even get a blank side pressed from a plant—I've called. They can do etchings and stuff, but they won't print a blank. That could only happen for me because of Wes." Now Harrison likes to get demos of songs from all his albums and EPs cut by Wolfe, in very small quantities, creating unique artifacts for his supporters. He briskly sold through a preorder run of 10 lathe-made records for jphono1's new album. Record lathes were once so large and expensive that only major companies owned them. As they get lighter, cheaper and more accessible, Wolfe won't be alone in finding ways to use them practically and even profitably. The innovative company Lathe Cuts, for instance, recently carved an R. Stevie Moore/Ariel Pink split onto mirrored acrylic that was gradually collected from the bins of a plastic supplier, and the first run of 66 sold out quickly with prices topping $80. Meanwhile, old-school lathe aficionados still use the bulky, hard-to-maintain Prestos, tooling replacement parts from washing machines and Victrola needles. The trade's lingo alone summons images of artisanal elves with jeweler's loupes and tiny chisels.If the mystique of the mass-manufactured record is strong (and sales trends indicate as much), the mystique of the hand-lathed one is weaponized." Antiseen Ate More Possum And Lived! Ruthless Band Managers, Do Ya Need Them? Moto Guzzi, Best Looking New Cafe Racer? The Tattoos That Will Keep You Out Of Heaven?